Solihull based Fleet Hire, have good reason to celebrate as they have been recommended for certification to the ISO 9001 Quality Management Standard and the Environmental Standard ISO 14001. 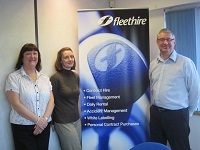 Our consultants Sue Cook and Liz Sherman supported the team from Fleet Hire through the process and they are delighted with their success. Project Manager, Graeme Wallis added ‘Since 2001 Fleet Hire has become a trusted brand by delivering on its promises through providing exceptional customer service. The achievement of these management standards will be a good platform to develop and grow the business across the UK. Fleet Hire Limited is an established, independent medium sized that focuses on supporting the national and local needs of fleet operators. Supported by leading edge technology and a strong financial base it is able to provide a diverse range of products and services to match the be-spoke needs of its customers. These range from basic fleet management or contract hire through to fully outsourced solutions.